The German invasion of the Soviet Union had been a certainty for Adolf Hitler for a long time. Advancing to the east meant Lebensraum (space to live) for the Germans to him. Hitler had already described this idea in his political work Mein Kampf. In his opinion, Germany was overpopulated and the nation needed more territory. He wanted to find this Lebensraum in Poland and in the Soviet Union. The Bolshevists were his arch enemies and he therefore considered the Soviet Union a more important goal than Great Britain. The Germans lost the Battle of Britain but they opened a new front in the east nonetheless. This two-front war was to prove fatal for Germany later on. Shortly after the plans to invade Great Britain were postponed indefinitely, the O.K.H. (Oberkommando des Heeres, Supreme Command of the Armed Forces) began making preparations for a plan to invade the Soviet Union, called Fall Fritz. Generalmajor Friedrich Paulus (Bio Paulus), future commander of 6. Armee, was one of the first officers to start working on the plan. The operation was to be launched in the spring of 1941. Hitler (Bio Hitler) gambled on a quick victory so the Soviet Union would be defeated before the onset of the feared winter. "We only have to kick in the front door and the entire rotten edifice will collapse," as Hitler told Generalfeldmarschall Gerd von Rundstedt (Bio Von Rundstedt) about the Soviet Union. Many officers agreed with him. Rittmeister von Rosenbach-Lepinski, commander of the 24. Panzerdivision allegedly had said that the war against the Soviet Union would last just four weeks. Because German forces were attacking the Balkans in the spring of 1941, the operation was postponed. Hitler had changed the name Fall Fritz to Operation Barbarossa after the Emperor of the Holy Roman Empire who had led the Third Crusade. Now, his name would be used for the crusade against Bolshevism. Hitler told his generals: "When Operation Barbarossa is launched, the world will hold its breath." At 03:15 in the morning of Sunday, June 22nd, 1941, Operation Barbarossa, the invasion of the Soviet Union, was unleashed. The largest military operation of all time had begun. The invasion force consisted of three army groups (Heeresgruppe) numbering 3,050,000 men, 3,580 armored vehicles, 7,184 guns, 600,000 trucks, over 600,000 horses and 1,830 aircraft. Heeresgruppe Nord with 26 divisions was commanded by Generalfeldmarschall Wilhelm Ritter von Leeb (Bio Von Leeb), Heeresgruppe Mitte counting 47 divisions was commanded by Generalfeldmarschall Fedor von Bock (Bio Von Bock) and Heeresgruppe Süd, numbering 43 divisions, was commanded by Generalfeldmarschall Gerd von Rundstedt. Those were faced on Soviet side by three so called fronts; the Northwest Front, the West Front and the Southwest Front, totaling 158 divisions and 54 brigades. Joseph V. Stalin (Bio Stalin) was completely taken by surprise, as he had expected an invasion only when Great Britain had been captured. Initially, the invasion proceeded successfully. 17 days into the attack, Heeresgruppe Mitte alone had taken 300,000 Soviet prisoners and had captured vast amounts of material. After 46 days, they had taken 850,000 prisoners. During the first days of the operation, the Luftwaffe destroyed 3,000 aircraft on the ground as well as in the air, almost half of the entire Soviet air force. Generalleutnant Erich Marcks, chief of staff of 18. Armee had proposed a two pronged advance to Moscow and Kiev with Moscow as the main target. Hitler however thought Leningrad should be the main target. He continuously interfered in the conduct of the battle, something that did not do the German army any good. Yet, the operation progressed very successfully for the Germans. Towards the end of September they had surrounded Leningrad, Odessa and Sevastopol. In December, they had taken 3,5 million prisoners and killed 4 million Soviet soldiers. Optimistic German planners thought they would have reached a line from Archangelsk in the north to Astrakhan in the south at the onset of winter in 1941. Along with the diminishing chaos on Soviet side during the summer, resistance intensified. Generaloberst Franz Halder, chief of the General Staff of the army felt less and less at ease. "Everywhere, the Russians fight to the last man, "he noted in his diary. "They capitulate very rarely." The Soviets possessed vast reserves though. Six months after the start of Operation Barbarossa, they had established 300 new divisions. Early October 1941, the Germans launched Operation Typhoon, the attack on Moscow but in December, the advance ground to a halt at the gates of the city. Winter had set in and tens of thousands of Germans suffered from frostbite. Vehicles could no longer move as the engines froze up. The German commanders realized, they had to fall back on defensive positions. Warnings by Soviet agent Richard Surge about Barbarossa had been ignored but now he managed to report that the Japanese were not about to attack Manchuria. Stavka did decide to listen; based on this information, troops were transferred from Siberia to Moscow. On December 5th, 1941, the counter attack commanded by General Georgia K. Zhukov (Bio Zhukov) was launched. The attack was an enormous success, at some places the Germans were pushed back over no less than 311 miles. After the battle for Moscow, the Germans had suffered their first defeat on the eastern front. Hitler sacked the supreme commander of the army, Walther von Brauchitsch (Bio Von Brauchitsch) and took command himself. After the battle, Ilya Ehrenburg, a writer of the army newspaper the Red Star, wrote this ironic comment: "The Russian winter was an unwelcome surprise for the Prussian tourist." “Living space”. Nazi term indicating the need for the overpopulated German lands to expand. The high command of the Russian military forces in World War 2, chaired by Stalin. State that occurs when a country is forced to fight a war on more than one border or different areas. During both wars, the First and second, Germany had to deal with a Western and an Eastern Front. During the World War 2 Germany even faced a third front, the Southern front, including the Mediterranean and North Africa. Street fighing in Stalingrad: the Soviets defend every yard. Friedrich Paulus and Adolf Hitler drafting Operatie Barbarossa. Soviet troops in the summer of 1941. A Soviet propaganda poster of the battle for Stalingrad. In the south, the city of Rostov on the river Don was captured by 1. Panzerarmee commanded by Generalfeldmarschall Ewald von Kleist on November 20th, 1941. On November 28th however, the city was abandoned again as the flanks of the spearheads were considered too weak. There were no troops available to support the spearheads so Gerd von Rundstedt, commander of Heeresgruppe Süd asked O.K.H. for permission to retreat across the river Mius. Adolf Hitler was furious because he could not believe Von Rundstedt had not enough troops at his disposal and he refused to permit Von Kleist to retreat. Von Rundstedt wanted to be relieved of his command when his conduct was no longer trusted by Hitler and so he was fired. On December 3rd, he was replaced by Generalfeldmarschall Walther von Reichenau (Bio Von Reichenau), former commander of 6. Armee. General der Panzertruppen, Friedrich Paulus, the officer who had helped draft Operation Barbarossa was placed in command of 6. Armee. He had never commanded a unit before and may well have been an experienced staff officer but now he was placed in command of the largest German army of World War Two: the 300,000 strong 6. Armee. Hitler was not overjoyed but approved the appointment. On January 17th, Von Reichenau was killed in an emergency landing of his aircraft and he was replaced by Generalfeldmarschall Fedor von Bock. On May 12th, the Soviets launched an attack on Kharkov, held by the Germans. They reacted quickly however, the southwest front of Marshal of the Soviet Union Semyon K. Timoshenko (Bio Timoshenko) was surrounded by Paulus’6. Armee and Von Kleist’s . Panzerarmee in Operation Fridericus. During this engagement, two Soviet armies were annihilated. It was Paulus’ first victory and for this he was awarded the Ritterkreuz (Knight’s Cross). On May 8th, 1942, Generaloberst Erich von Manstein (Bio Von Manstein), commander of 11. Armee was ordered to capture the Kerch peninsula, Operation Trappenjagd. On May 16th, he had captured the peninsula of the Crimea as well as the Kerch peninsula. On June 5th, the siege of Sevastopol began, code named Störfang. The garrison in the city was commanded by the very capable general Ivan J. Petrov. Yet, on July 3rd, Von Manstein captured the city after it had been pounded by Luftflotte 4, commanded by Wolfram Freiherr von Richthofen. For this victory, Von Manstein was promoted to Generalfeldmarschall. In the battles near Kharkov, on the Crimea and Kerch, the Soviets had lost over half a million men, a quarter of them taken prisoner. The Germans felt invincible again and the sour aftertaste of the previous winter was all but forgotten. By the onset of spring – and the inherent mud - the front had finally been stabilized. On June 28th, 1942, a little more than a year after the launch of Operation Barbarossa, a new offensive was launched, Fall Blau (case blue). In his Führer Direktiv 41 Hitler had set two main goals for Heeresgruppe Süd: the capture of the Caucasian oil fields and reaching the river Volga near Stalingrad. Von Manstein’s 11. Armee was dispatched to Leningrad in the north so the offensive had to be carried out minus one army. The offensive came in three phases. The first, Fall Blau, consisted of an attack by 4. Panzerarmee, 2. Armee and the Hungarian 2nd Army. They were to advance out of the region around Kursk towards Voronezh on the Don. Two days later, Operation Maus would be launched: 6. Armee was to push to the river Don and subsequently advance in the direction of Stalingrad parallel to the Don; west of the Don, it was to encircle Soviet troops. A few days later, Operation Siegfried was unleashed: 1. Panzerarmee and 17. Armee were to advance towards Rostov. The name Fall Blue is widely used to describe all three operations simultaneously. Joseph V. Stalin had expected the new offensive to take place near Moscow and was highly amazed attacks were launched in the south. Original German plans of operation had been captured but Stalin did not believe they were genuine. Again the Soviets were poorly prepared when the offensive began. A counter attack against 4. Panzerarmee ended in utter failure. Voronezh was the prime target of the first phase of Fall Blau but Hitler did not want the advance of 4. Panzerarmee in the southeast to be delayed by the capture of the city. Von Bock assured Hitler Voronezh was only weakly defended so Hitler withdrew units from 4. Panzerarmee, consequently the attack on Voronezh could only be continued with just one armored corps. This was a disastrous solution: the Soviet defense was stronger than expected. The Soviets held on to the town until it was captured on July 9th. Fall Blau was completed but Hitler grew increasingly impatient over the postponement which was of his own making actually. The main element of Fall Blau was a speedy advance by 6. Armee and 4. Panzerarmee towards Stalingrad in order to cut off the withdrawal of Timoshenko’s forces. Subsequently, the attacks on Rostov and the Caucasus would be launched but Hitler was so obsessed by a faster advance towards the Caucasus he decided to launch both operations simultaneously. Therefore Hitler decided to split Heeresgruppe Süd in half. Generalfeldmarschall Fedor von Bock voiced his anger about the decision to split up Fall Blau and he was subsequently sacked by Hitler, also for his mistakes at Voronezh. As a result of the split, Heeresgruppe A and B were created. In Operation Braunschweig, the continuation of Fall Blau, Heeresgruppe A commanded by Generalfeldmarschall Wilhelm List was to capture the Caucasus while Heeresgruppe B commanded by Maximilian Reichsfreiherr von Weichs was to advance to the Volga near Stalingrad. The other German generals were also utterly amazed as there were not enough means available to achieve these two goals simultaneously. Moreover, 6. Armee was robbed of its XXXX Panzerkorps, slowing its advance even more. On July 16th, Hitler ordered 4. Panzerarmee to advance to the far south in order to support 1. Panzerarmee in its attack on Rostov and subsequently encircle the Soviets. The encirclement failed but Rostov was captured by 1. Panzerarmee on July 23rd. After the removal of 4. Panzerarmee, Heeresgruppe B had been robbed of its tanks. 6. Armee, mainly consisting of infantry, now stood alone in its advance to the Volga. A shortage of fuel also slowed the advance considerably as 6. Armee suffered severe problems of supply. As Heeresgruppe A and B were moving away from each other, the lines of supply were becoming far too long. Von Weichs and Paulus complained to Hitler’s adjutant that 6. Armee was far too weak to withstand all counter attacks. Therefore, Hitler decided on July 30th to send 4. Panzerarmee back north from the Caucasus and much time and fuel was wasted with these movements. Three Soviet armies stood close to Stalingrad: the 62nd commanded by Kolpakchy, the 63rd commanded by Kuznetsov and the 64th of Chuikov. They made up the Stalingrad front but their strength was illusionary: the three armies together, numbering some 200,000 men were very much weaker than 6. Armee counting 300,000 men. On July 23rd, 6. Armee penetrated the right flank of 62nd Army. Stavka had hoped to be able to fight the Germans west of the Don but the Soviet front was like a sieve. On July 25th, Chuikov’s 64th Army also came under heavy attack. Large parts of 62nd and 64th army managed to flee east across the Don after having heard rumors they risked being cut off by the Germans. Troops of 64th Army managed to blow up the crucial bridge across the Don near Nizhne-Chirskaya under the noses of the Germans. Many Soviet troops had managed to flee east across the Don and only a small number of prisoners was taken. In the chaos, Joseph Stalin once again decided to re-organize the command structure. The Stalingrad front was split in half: the northern part – the new Stalingrad front – was placed under command of Lieutenant-general Vasily N. Gordov, the southern part – the new southeastern front - was placed under command of Colonel-general Andrie I. Yermoymenko, who was opposed to a split in the middle of the town but Stalin could not be bothered. Furthermore, civilians had been mobilized in the entire area. All available men and women between the ages 16 and 35, totaling almost 200,000 were deployed to dig tank ditches. Young children were deployed to build earthen walls around the oil tanks on the banks of the Volga and air defenses were mainly crewed by young women. On August 19th, Paulus gave orders to launch the attack on Stalingrad. At daybreak on August 21st, companies of infantry of LI Armeekorps of 6. Armee crossed the river in inflatable landing craft and quickly established a bridgehead near the village of Luchinski. Shortly after, a battalion of engineers arrived to build bridges for the tanks and other vehicles. On Sunday morning, August 23rd, the march across the steppe between the rivers Don and Volga started. Only slight resistance was encountered. As a result of the draught, the ground was as hard as a rock so the progress was fast. There was hardly an enemy to be seen. 6. Armee with XIV Panzerkorps in front advanced east in the direction of Stalingrad and 4. Panzerarmee drove northeast. Towards late afternoon, a German spearhead closed in on the northern suburbs of the city. They watched as a vast armada of Junkers Ju 88s and Heinkel He 111 bombers flew in the direction of Stalingrad. That night, the Luftwaffe began bombing the city. It was the heaviest bombardment on the eastern front during World War Two. The wooden buildings on the western outskirts of the city were subjected to a hail of incendiary bombs. The large oil tanks on the banks of the Volga were also hit. Burning oil spread across the Volga and the column of smoke could be seen miles away. The city had turned into an inferno claiming the lives of some 40,000 civilians in a week. The battle for Stalingrad had begun in earnest. The battle for Stalingrad took place in the south of the Soviet Union during World War nearTwo the river Volga. The battle lasted from 23 August 1942 until 2 February 1943. Approximately one million Soviets and one hundred and fifty thousand axis soldiers were killed. The battle was one of the cruellest of the World War 2 and considered a turning point, because the Axis-countries lost the battle and it triggered the start of their retreat. Fall Blau. Bron: Marcel Kuster, TracesOfWar.com. Soldiers of 6. Armee on the steppe between the rivers Donets and Don, some day in July 1942. Bron: www.privates-antiquariat.de. The high west bank of the river Volga. Stalingrad was a modern city consisting of large white apartment buildings with beautiful parks and gardens along the west bank and in particular many factories. The city stretched some 24.8 miles from north to south along the west bank of the Volga and was nowhere more than 5 miles in depth. Many factories were situated in the north of the city: the Dzerzhinsky factory producing tractors, the Krasny Barrikady factory producing tanks, the steel mill Krasny Oktyabr and the chemical plant Lazur. These factories produced valuable material for the Red Army. The steel mill Krasny Oktyabr employed 20,000 men and the Dzerzhinski factory produced 250 T-34 tanks each month. Once the Germans had taken Stalingrad, they were in control of shipping on the Volga. These were the reasons why Hitler had Stalingrad captured by Heeresgruppe Süd. Also, Stalingrad was named after the leader of the Soviet Union but about this, Hitler remarked: "I wanted to reach the Volga at a certain place near a certain town. By coincidence, she is named after Stalin but don’t you think I went there because of that – she could have been named quite differently – but it is a very important place." Command of 62nd Army had switched to Lieutenant-general Anton I. Lopatin in August. His army had been driven back to the center of Stalingrad. 64th Army, which had been taken over from Chuikov by Lieutenant-general Mikhail S. Shumilov was located in the southern suburbs. The first German unit to reach the Volga was a spear point of 16. Panzerdivision which reached the river at the northern suburbs of the city. It encountered fierce resistance from batteries and anti-aircraft guns. The Germans were taken by surprise but quickly went onto the offensive. In the evening the last guns were destroyed, mainly operated by women to the horror of the tank crews. Chaos on Soviet side was enormous. The Soviet commanders ordered the recently constructed pontoon bridges across the Volga to be destroyed, fearing the German tanks would establish a bridgehead on the east bank. Stalin was furious when he heard the Germans had reached the Volga. He prohibited the evacuation of civilians from the city. The city was to be defended to the last man. He thought the Soviets would fight harder for an inhabited city than for an empty one. Even factory workers, who were not directly involved in weapons production were mobilized in special brigades. These were hardly armed and thrown into battle against the German tanks. The workers in the tractor factory had switched to construction of the T-34 tank. Even before they had been painted, they would be thrown into battle, straight from the factory and often crewed by the men who had just made them. In the end, the inhabitants were given permission to cross the Volga in boats, requisitioned by the N.K.V.D. There not many vessels available however as most of them were in use to evacuate the wounded and to deliver ammunition. The Luftwaffe heavily bombed the vessels, make the crossing certainly not without danger. German tanks and artillery also sank a lot of vessels. Lopatin was not up to the situation any more. He had grown increasingly pessimistic about the superior troops facing him and he started withdrawing units without having been ordered to. Andrei Yeryomenko and Nikita S. Chrushev, the political commissioner at the Stalin front, therefore relieved him of his function on September 3rd. Lieutenant-general Chuikov was still hanging around at 64 Army’s headquarters, hence he was selected to take command of 62nd Army on September 12th. The situation of the army was bad, it counted not yet 20,000 men and less than 60 tanks. Chuikov had established his headquarters on the Mamayev Kurgan, the Tartar burial hill in Stalingrad. To ease the supply of his 62nd Army, he wanted to launch an offensive on September 14th in order to better protect the vulnerable landing stages. The Germans however beat him to it: they too opened a massive offensive in the early morning of the 14th, aimed directly at the Mamayev Kurgan. Chuikov’s headquarters were subjected to heavy fire and all contact with his troops was lost. He described the situation as "somewhat unpleasant." Later that day, he and his staff left for the Tsaritsyn bunker near the spot where the rivers Tsaritsa and Volga converged. At the end of the afternoon, Yeryomenko informed Chuikov that 13th Guards Rifle Division of General-major Alexandr I. Rodimtsev was to re-inforce 62nd Army. This division was at full strength, consisting of nearly 10,000 men. However, bad news came in: the Germans were advancing towards railway station Stalingrad-1; should they capture it there was grave danger they would occupy the landing stage as well before the arrival of the 13th Guards Rifle Division. In the early hours of September 15th, Rodimtsev managed to cross the Volga with the better part of his division. It was not a moment too soon as the Germans resumed their attack in the morning. The division fought against the German 71. Infanteriedivision and in the course of the day, the station changed hands four times but in the evening, it was back in Soviet hands. During the day, heavy fighting was also going on around the Mamayev Kurgan, on staff maps better known as ‘Feature 102’. On September 17th, fierce fighting raged again around the station. Near the center of town, on an important road leading to the Volga, a platoon of the 42nd Guards Regiment commanded by Sergeant Yakov F. Pavlov occupied an apartment building. With anti-tank rifles, mortars and machine guns, they managed to hold on against an overwhelming German presence for 58 days. In the south of the city, near the grain depot, fierce battles also raged: 48 Soviet soldiers held out for days against a German majority but on September 22nd, the Germans captured the depot. Similar fights against small units claimed much time and many men from the Germans and their morale deteriorated considerably. Chuikov’s command post had become too dangerous in the mean time since it was continuously subjected to German machine gun fire. The staff crossed the river to return to the west bank further north. He established his headquarters beneath a few oil tanks southeast of the gun factory. On arrival, it became apparent many high ranking staff officers had deserted. On September 18th, railway station Stalingrad-1 definitely fell in German hands. There were no more reserves left to recapture the station and the 13th Guard Rifles Division had been all but eliminated. South of the city, the Germans had also reached the Volga; they had sliced through the junction between 62nd and 64th armies, completing the encirclement. The only way to deliver supplies to the Soviets now was across the 0,93 miles wide river Volga. The situation of 62nd was now almost hopeless. Yeryomenko attempted to relieve the pressure on 62nd Army by attacking from the north but this ended in failure. Chuikov had relocated his headquarters and this did the morale of the Soviet troops a lot of good. The focus of the battle slowly shifted to the northern part of the city. The southern and the central parts could no longer be held. On September 22nd, the last phase of the battle in the northern part of the city set in. The Germans had captured the landing stages and apart from a few pockets of resistance, only the northern part of town was still in Soviet hands. The battle in the city however did not produce the desired results for the Germans either. Generaloberst Franz Halder, chief of the general staff of the army, emphasized his concern about the weak flanks of 6. Armee to Hitler. Hitler had enough of him and on September 24th, Halder was replaced by Kurt Zeitzler who was immediately promoted from Generalmajor to General der Infanterie. Zeitzler was an obedient yes man. After Halder’s discharge there was nobody left near Hitler who dared oppose him. Stalingrad. Bron: TracesOfWar.com, Marcel Kuster. A Soviet artilley piece in the city. 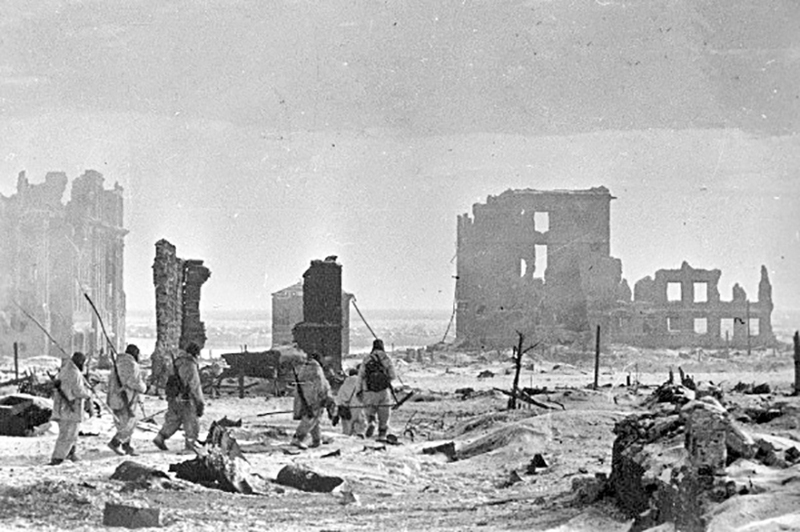 Soviet soldiers advance among the ruins of the city. The Grain warehouse today, a building that saw fierce fighting in September 1942. Bron: Felix Dalberger. On September 28th a shift in command was made again: Stalin renamed Yeryomenko’s Southeast front to Stalingrad front while Gordov’s Stalingrad front was dissolved. In its place, the Don front was established commanded by Lieutenant-general Konstantin K. Rokossovsky and Gordov was appointed Yeryomenko’s deputy. The fighting in and around the factories entailed horrendous man to man combat. German tanks were useless during the street fighting. The terrain had been plastered by the Luftwaffe but this turned out more advantageous to the defenders: the Germans were unable to move rapidly through the rubble and the Soviet found ideal cover. The Soviets also applied new tactics. Small, flexible mobile units continuously attacked the Germans. The German Blitzkrieg tactic proved utterly useless in the town and they did not quite know how to handle this new situation. As the battle progressed, the Soviet air force grew increasingly stronger. The U-2s, known to the Germans as the sewing machines (due to the characteristic sound of their light engines), bombed the German positions at night. The new Yak-1 and Yak-9 fighters engaged the Luftwaffe for dominance in the sky. Towards the end of September, Paulus issued orders to attack the last strongholds of the Soviets. 24. Panzerdivision and 389. Infanteriedivision captured the workers suburbs of the three large factories. The 389. Infanteriedivison attacked the tractor factory together with the 24. Panzerdivision. After the latter had captured the factory, it swung south again in the direction of the chemical plant. It had cost them dearly though, over half of the division had been destroyed. The 389. Infanteriedivision fought its way through the tractor factory and then attacked the gun factory. On October 18th, representatives of 62nd Army reported the morale of he troops was rising and less men were deserting. The Soviets did maintain order with a merciless hand: nearly 15,000 soldiers were executed during the battle. Many others were sent to Gulag labor camps or placed in penal companies. These companies had to carry out the most dangerous tasks at the front like clearing mine fields in the heat of battle by marching straight through them, often at gun point. The Germans also started to deploy Soviet p.o.w.s and deserters at the front in order to compensate for the grievous losses in men. These so-called Hiwis (Hilfswillige, "voluntary" helpers) mainly performed secondary duties such as delivering ammunition. October 14th was the most critical day for Chuikov’s army. The Luftwaffe flew some 3,000 sorties and the tractor factory and the gun factory were attacked by five German divisions. The tractor factory was almost surrounded and the Germans pushed on towards the Volga. That night, the Volga ferries evacuated 3,500 injured Soviet soldiers. The next day, the attack was resumed: 62nd Army was split in half but the German attack faltered. Paulus could not expect new reserves; all available means were already deployed. Chuikov received few supplies and re-inforcements as well. Those were available though but slowly it dawned on Chuikov that someplace else, something really big was brewing. The battle was now getting too close to his headquarters for Chuikov’s comfort. He asked Yeryomenko’s permission to transfer part of his staff to the east bank of the Volga but his request was denied. It was considered best for morale when the staff remained where it was. On October 21st, the Germans once more launched an attack on the gun factory and the steel mill but without any success worth speaking of. Yet the Germans continued sending troops to the factories. In both, fighting took place between small groups of Germans and Soviets. In workshops, the ovens, the foundry, every yard was contested. The factories were defended by three Soviet divisions but after a few days of fighting all that was left was a few hundred men. Yet, they held on and in this way they continued to tie down the largest part of 6. Armee in the town. On November 8th, Hitler delivered a speech in the Löwenbraukeller in Munich, claiming the city of Stalingrad had almost been captured. 90% of the city was in German hands, including the chemical plant Lazur, situated in the bend of a railway line and which was called the tennis racket by the Germans after its shape. Parts of the steel mill and a bridgehead near the landing stage were still in Soviet hands. The Ministry of Propaganda of Joseph Goebbels (Bio Goebbels) could not wait to announce the capture of Stalingrad to the population. Goebbels understood victory was not yet near but he concocted a ruse to mislead the home front. In the German positions in Stalingrad, the men were listening to the Christmas program of the Grossdeutsche Rundfunk. To their amazement, they heard the announcement: "This is Stalingrad" followed by a choir singing Silent Night, Holy Night. Actually, this had been recorded in a Berlin studio. Most of the soldiers in Stalingrad were furious about the German population being lied to in this way. The contrast between the letters sent home by the Germans and the Soviets is striking. While the German letters leaned towards the sentimental, the longing to go home, the Soviet letters bore witness to the irrefutable logic that Mother Russia comes first. A German physician wrote: "In our hearts, we keep hoping everything will turn out well. Christmas was not pleasant, in times like these, festivities are out of place. One may not expect too much from luck." In contrast, a Soviet soldier wrote: "Darling, we are driving the serpents back to where they came from. Our successful advance brings our next meeting closer." Soldier Kolya wrote: "Hello Maria, I have been fighting here for three long months in order to defend our beautiful ********* (deleted by censor). We have brought heavy pressure on the enemy. Now we have surrounded the Germans. Each week, a few thousand are taken prisoner and a few thousand are killed on the battlefield. Only the most stubborn SS soldiers are still here. They have barricaded themselves in bunkers and are firing from there. And now, I am going to blow up one of those bunkers. Greetings. Kolya." Officially the name for the governmental organisation responsible for the management of labour camps in the Soviet Union but later used to designate the camps themselves. The camps were situated in the northern areas of the Soviet Union and in Siberia. They were a major factor in the suppression of the Soviet people. Prisoners were mostly (real or perceived) enemies of the communist regime. From 1929 until Stalin’s death in 1953 18 million Soviet citizens were deported to the Gulag. It is estimated that 4.5 million of them died there. The steel mill Krasny Oktyabr where heavy fighting took place. German troops in a factory in the north of the city. Bron: http://www-ii.org. After the Soviets are surrounded, supplies can only be delivered across the Volga; resulting in heavy losses. The Mill of Stalingrad today, one of the few remaining witnesses of the battle for Stalingrad. Bron: Felix Dahlberger. In utmost secrecy, generals Georgi Zhukov and Alexandr Vasilevski (Bio Vasilevski) had begun drafting a plan to eliminate the Axis forces at Stalingrad. They noticed the flanks of 6. Armee were poorly defended. The Germans had mainly deployed Romanians and Italians there. Generalfeldmarschall Gerd von Rundstedt had called this assembly of Axis forces the "ideal army of the League of Nations." These armies were smaller than the German and the men were far less armed and trained. Although the Germans knew this they opted to deploy the entire 6. Armee in Stalingrad anyway. While Adolf Hitler still took many military decisions all by himself, Joseph Stalin granted his generals increasingly more freedom. Although he himself wished the attack to take place early November, he permitted Zhukov and Vasilevski to wait until the circumstances were most favorable. The two generals wanted to penetrate the weak northwestern and southern flanks and in so doing surround 6. Armee. They wanted to give Stalingrad a wide berth in order to prevent 6. Armee from eventually launching a quick counter attack. In deepest secrecy, a massive combat force was assembled, numbering over a million men, nearly 1,000 tanks, some 14,000 guns and mortars and some 1,250 aircraft. By the way, this force was hardly larger than the entire Axis forces in the area. Colonel-general Nikolai N. Voronov, supreme commander of the Red Army artillery and representative of Stavka, was to coordinate the artillery barrage. Keeping the attack a secret had succeeded very well. Many Germans did expect an attack but were skeptical about the Soviet capability to launch such a massive offensive. On August 24th, the Soviets had captured two bridgeheads on the south bank of the Don in two counter attacks, one on Serafimovich and the other on Kletskaya. In October 1942, General de Armatã Petre Dumitrescu, commander of the Romanian 3rd Army, had submitted a proposal to recapture these two bridgeheads but it was rejected by the Germans as no troops could be made available. On November 19th, 1942, at 07:20 Russian time, the Soviets were ordered to load their guns, mortars and Katyushas. They opened the attack out of the two bridgeheads at Serafimovich and Kletskaya in the northwest. According to a Soviet general, the fog was "thick as milk" and postponement of the attack was considered briefly. Ten minutes later, Voronov’s artillery, a total of 3,500 pieces, unleashed an 80 minute barrage on the Romanian army. Dozens of miles behind the front, officers of the 22. Panzerdivision even woke up as the earth shook like in an earthquake. Right after the barrage the infantry moved in, supported by tanks. The Romanians fought like lions but the Soviets were just too strong, scattering the Romanians in all directions. The only unit capable to stop the steam roller was the XXXXVIII Panzerkorps, stationed in the Romanian rear area. This corps however was far too weak as it had yielded a few of its units to others and many of its tanks were out of service because mice had eaten through the electricity cables. The few tanks still operational crossed the path of the 5. Tank Army of Colonel-general Romanenko. They inflicted some damage but Romanenko simply drove past the corps without being delayed noticeably. In the morning of November 20th, 51st and 57th armies began their advance to the northwest out of the area near the lakes south of Stalingrad. The attack was to commence at 08:00 hours but was postponed until 10:00 due to heavy fog. The Soviets here also easily broke through the lines of the Romanian 4th Army. On November 23rd, the ring was closed. The two Soviet spear heads met near Kalakh where they captured the bridge across the Don intact. In total almost two entire German armies were surrounded, consisting of five corps, each consisting of 21 German and two Romanian divisions. A Croatian regiment belonged to one of those divisions. Surrounded units of 4. Panzerarmee were added to 6. Armee, making 6. Armee over 300,000 strong. They faced seven Soviet armies and four air fleets. German reactions to the encirclement were mixed. Some, mainly junior commanders, thought an attempt at breakout should be made immediately. Others did not feel like leaving their positions, not only because it had taken so much trouble to capture them but also because the ruins of the city offered at least some protection against the Russian winter. As it was, the rear area of the army had to be defended. Paulus had already dispatched his armored divisions to the Don. He also understood immediately, he needed support from the air and supplies. If necessary, he also wanted a free hand to break out of the Cauldron. The response came almost immediately, not from the commander of Heeresgruppe B, Maximilian Reichsfreiherr von Weichs but from Adolf Hitler himself. 6. Armee was to hold its positions and be aware he would do anything necessary to help and relieve it. He would issue his orders in due time. Moreover he ordered Paulus to pull all units of 6. Armee west of the Don back east in the direction of Stalingrad. In the night of November 23rd, Hitler designated Stalingrad a Festung (Fortress) which was to be defended to the last. Adolf Hitler asked Reichsmarschall Hermann Göring (Bio Göring) whether his Luftwaffe was capable of supplying 6. Armee from the air. Generalleutnant Eduard Wagner, Oberquartiermeister (quartermaster-general) at the O.K.H. had estimated the number of surrounded troops at 300,000 but there was uncertainty about this number. An estimated minimum of 500 tons had to be flown in daily and to achieve this, some 500 Junkers Ju 52-3m transport aircraft would be required. Yet the numbers were adapted, the absolute minimum was set at 300 tons a day and 300 aircraft. To General der Infanterie Kurt Zeitzler, chief of the general staff of the army and Generaloberst Hans Jeschonnek, chief of the general staff of the Luftwaffe, it seemed impossible to supply 6. Armee by air. Hitler and Jeschonnek had discussed an air lift before. Hitler compared this one to the air lift in the spring of 1942 near Demyansk. However, a third of the number in Stalingrad had to be resupplied there, in spring instead of in winter and with negligible resistance from the Red Air Force. Yet Göring ignored all advice and with utter disdain for the possibilities, he took on the job of supplying 6. Armee by air. Plans were also drafted to relieve 6. Armee. On November 21st, Hitler had ordered the establishment of Heeresgruppe Don commanded by Generalfeldmarschall Erich von Manstein. Its main goal was to relieve 6. Armee although the unit hardly received any troops for it. Von Weichs, Paulus and his five corps commanders were unanimous in their opinion: 6. Armee must break out before the Red Army could stabilize its front southwest of Stalingrad. Generalmajor Arthur Schmidt, chief of staff of 6. Armee reminded Paulus that Hitler had expressly ordered to hold on. Paulus was not a person to ignore Hitler, whatever his own ideas might be. Schmidt also reminded him, there would be insufficient fuel for a breakout to the southwest and that the army would be far too weak on the exposed steppe. The air lift that started on November 25th, fell far short of its goals. Over the first five days, only some 175 tons was flown in but mainly because of bad weather. Fierce Soviet anti-aircraft defenses and attacks by fighters inflicted grievous losses on the air fleet. Over the entire duration of the air lift, the Luftwaffe flew an average of only 117 tons into the cauldron. The target of 300 tons daily was only reached three times. Erich von Manstein had been given a difficult task: his Heeresgruppe Don consisted of 6. Armee, 4. Panzerarmee and the Romanian 3rd Army. The majority by far of these were surrounded themselves. Von Manstein ordered Generaloberst Hermann Hoth (Bio Hoth) the commander of 4. Panzerarmee – now rebaptized Armeegruppe Hoth – to launch Operation Wintergewitter, the relief of Stalingrad. Hoth and his staff had little or nothing to do any more since most of 4. Panzerarmee was surrounded at Stalingrad. Hoth’s spear head was to consist of LVII. Panzerkorps commanded by General der Panzertruppe Friedrich Kirchner which had been extracted from Heeresgruppe A. It was not Hoth’s intention to fight himself all the way to the Cauldron. 6. Armee itself would have to meet the relief forces half way. This operation was code named Operation Donnerschlag. Von Manstein knew very well Hitler would never permit this so he had hidden this in his plans of operation. Although his forces were far from complete, Von Manstein sent Hoth on his way on December 12th. Initially, Soviet resistance was light. 51st Army commanded by General-major Trufanov, the first unit to be engaged by Hoth, was obviously not strong enough to stop the German attack. They did slow down Armeegruppe Hoth considerably though. Coinciding with Operation Wintergewitter, the Soviets launched an operation of their own, code named Little Saturn. This operation was aimed at the Italian 8th Army. By a rapid advance south, the Soviets hoped to cut off the retreat of Heeresgruppe A out of the Caucasus. 6. Armee though continued tying down seven Soviet armies at Stalingrad so less troops could be made available to Little Saturn. For Heeresgruppe A to survive, it was important 6. Armee should hold on. Although he has never been clear about it, in Hitler’s opinion all Armeegruppe Hoth had to do was to open up a corridor in order to provide 6. Armee with badly needed supplies. When it dawned on the Soviets that Hoth’s offensive was a serious action, it was decided to transfer 2nd Guards Army commanded by Lieutenant-general Malinovski – which was to take part in the attack on the Italian 8th Army – to the area between 6. Armee and Hoth’s spear head. 5th Shock Army commanded by Lieutenant-general Popov and 7th Tank Corps commanded by General-major Rotmistrov were closing in on the area as well. Strangely enough, Paulus showed little enthusiasm for a breakout. He seemed to be willing to wait until Hoth had managed to fight himself through to him. Hoth, who now faced stiff resistance himself, could only hope for a breakout by Paulus towards the rear area of the Soviet forces. Therefore, Von Manstein contacted Paulus but he evaded the issue. It was the chief of staff of 6. Armee, Generalmajor Arthur Schmidt who took the decision. He was a convinced Nazi and excluded a breakout. He was of the opinion, 6. Armee had not enough fuel and would be too weak on the open steppe. There was to be no breakout. The German soldiers in the south of the Cauldron could see the flashes of gunfire that lit up the night sky and they could hear the explosions. Shortly before Christmas, the spirits were high. Hoth stood at 30 miles from the Cauldron and the men of 6. Armee were convinced they would be relieved. On Christmas Eve, 2nd Guards Army launched its attack and Hoth was forced to retreat. The soldiers in the Cauldron saw the flashes on the horizon disappear slowly. The chance at relief had been lost. Usually consisted of two or three neighbouring Armees, sometimes German and Axis-allied Armees. One Armee HQ, usually the German, temporarily became the commanding HQ of the other Armees. An Armeegruppe would always be subject to a Heeresgruppe. Later in the war the size of an Armeegruppe or Panzergruppe varied significantly. From 1943 onwards an Armeegruppe could be the size of an Armee or just the size of a corps. International league of Nations for cooperation and security (1920 – 1941). The League was located in Geneva, in neutral Switzerland. During the 1930s the league of nations could do little against aggressive behaviour of Japan, Manchuria, Italy, Abyssinia and Hitler. The league of nations was in fact the predecessor of the United Nations. Operation Uranus. Bron: TracesOfWar.com, Marcel Kuster. The freezing cold is the worst enemy of the transport aircraft during the air lift. Bron: http://www.privates-antiquariat.de. Due to a shortage of fuel, most of the vehicles had to be left during the retreat to Stalingrad. Bron: http://www.privates-antiquariat.de. In January it began to dawn on the men of 6. Armee that Operation Wintergewitter had failed. The exhausted and starving men began to understand the cruel reality but morale did hardly suffer. Many men kept hoping for a miracle and retained their confidence in the staff. The conditions for 62nd Army of Vasily I. Chuikov weren’t easy either but at least it was part of a ring of steel of seven armies surrounding Stalingrad. Supply in particular had posed a problem for Chuikov but that soon changed. It had become steadily colder in Stalingrad and now the Volga was finally frozen over. Supplies could now easily be delivered since the chunks of ice had made this all but impossible and so nearly everything had to be flown in. Chuikov’s battered forces opened a small offensive against the Germans who were still holding the tractor factory and the Mamayev Kurgan. The Germans could not be driven off though. 6. Armee continued to offer resistance and still tied down a considerable number of Soviet troops that could be better deployed elsewhere. Colonel-general Rokossovski, commander of the Don front, arrived at the conclusion that a large scale operation was required to eliminate the Germans in the Cauldron. Colonel-general Nikolai N. Voronov, Stavka’s representative and Rokossovski decided to wait for an offer of honorable surrender anyway. On January 8th, they sent a number of envoys to the Germans with the conditions of capitulation drafted by Voronov and Rokossovski. Paulus was not convincing enough to make the determined Schmidt accept and so, the offer was rejected. Therefore Voronov and Rokossovski decided to start a new operation on January 10th, code named Operation Koltso, meaning ring. The Soviet armies would attack the Germans from the north, south and west and so drive wedges between the German units in the Cauldron. The operation was preceded by a massive bombardment again: for 55 minutes thousands of guns and mortars pounded the German positions while hundreds of aircraft dropped their bombs. At 09:00 hours, the infantry attacked from all directions. What had taken Paulus weeks to capture was recaptured in only days by Voronov’s and Rokossovski’s forces. On January 14th, the Germans lost their most important air field, Pitomnik; Gumrak was captured on the 21st. Next day, the Stalingradski air field, near the suburbs of Stalingrad was opened but was captured by the Soviets the next day. From that moment on, all supplies had to be dropped by parachute. A number of German generals and other officers had managed to escape to safety by flying out of the surrounded area, leaving many ill and injured soldiers behind. These officers included many specialists, who were to help in re-establishing the units destroyed. Many soldiers and officers pretended to be ill or injured in order to secure a place aboard one of the aircraft. The Feldgendarmerie maintained order with a stern hand though. On January 24th, the Don front attacked Stalingrad west of the Mamayev Kurgan. Two days later, forward units of 21st Army and 65th Army of the Don front made contact with units of the 13th Guards Rifle Division of 62nd Army. The Axis forces had been cut in half. The southern half commanded by Generaloberst Paulus contained four corpses and the staff while the northern half in the area around the Dzerzhinski tractor factory contained encircled forces of XI Armeekorps commanded by General der Infanterie Karl Strecker. On January 29th, the southern part of the Cauldron was split again by forces commanded by Rokossovski. Following the fall of Gumrak, Paulus moved his headquarters to the Univermag department store in the center of Stalingrad. Lieutenant-general Mikhail Shumilov, commander of 64th Army in whose sector this store was situated, found out on January 30th. In the early morning of the next day, his headquarters was surrounded. Shortly afterwards, Paulus was promoted to Generalfeldmarschall, 118 other officers were also promoted, even some who had already surrendered. Never in the history of German warfare, a field marshal had surrendered so Hitler expected Paulus either to fight to the death or commit suicide. Paulus, usually very obedient, did not take this last hint of his Führer. The fanatical chief of staff Schmidt urged Paulus to continue fighting until the bitter end in order to be able to inspire German armies for years to come with this sacrifice but Paulus did not listen anymore. Later in the day, Soviet officers entered the basement. Paulus was lying quietly on his bed, smoking and, still dressed in the uniform of Generaloberst, was taken to Shumilov. Paulus had not ordered 6. Armee to surrender but the central and southern Cauldron surrendered on their own accord that day. The northern Cauldron, containing XI Armeekorps with six severely battered divisions, continued fighting though. On February 1st, Hitler ordered Strecker to hold the Cauldron until the last man. The Soviets were furious about Strecker’s refusal to capitulate so Rokossovski ordered the artillery on the Don front to destroy the Korps. On February 2nd at 08:40, Strecker radioed a last message to Hitler: "XI Armeekorps and its divisions have fought to the last man against an overwhelming majority. Long live Germany." Some sources report Hitler had promoted Strecker to Generaloberst at the last moment but it is unclear whether Strecker received this message. At 10:00 hours, Strecker finally surrendered with 33,000 men. On February 3rd, local skirmishes were still going on; efforts by small groups of men attempting to break out or by soldiers who knew nothing of the surrender. Later in the day, silence fell over Stalingrad. The battle had come to an end. The day after the battle, February 3rd, the O.K.W. announced the defeat: "Sie starben damit Deutschland lebe" (They died so Germany will live). The defeat at Stalingrad finally tipped the balance against the Axis powers. Operation Ring. Bron: TracesOfWar.com, Marcel Kuster. German soldiers surrender. Bron: http://www.privates-antiquariat.de. The Soviets recapture the top of Mamayev Kurgan. The ultimate end: endless columns of German pow’s leave Stalingrad. In the days and weeks after the battle, both the O.K.W. and Stavka started drawing up the balance. In military, psychological and humanitarian sense, the Axis powers had received a devastating blow. Nearly six Axis armies had been obliterated: the entire 6. Armee, the better part of 4. Panzerarmee and almost the entire Romanian 3rd and 4th armies. Moreover, the largest part of Luftflotte 4 had also been destroyed. Farther to the northwest, the Italian 8th and the Hungarian 2nd armies had been eliminated during the heavy fighting. During the battle as a whole, some 700,000 Soviet soldiers and over 100,000 civilians had been killed. In and around Stalingrad, some 470,000 soldiers had died and some 130,000 had been taken prisoner: 91,000 on January 31 and February 22nd. A total of 30 generals was taken prisoner, eight of them escaped from the Cauldron and six generals were killed. The Luftwaffe lost 575 aircraft in the course of the airlift. They managed to evacuate no less than 25,000 men from the Cauldron though. On both sides, vast amounts of materials were lost as well. Between August 1942 and February 1943, the Axis powers lost a total of some 3,500 armored vehicles and 3,000 aircraft. The amount of material lost during that period would have been sufficient to equip an estimated 75 divisions. The Soviets lost some 4,500 armored vehicles, 16,000 guns and 3,000 aircraft. Of course it is all but impossible to express these losses in numbers. A lot of irreplaceable and experienced officers and men were either killed or taken prisoner. It was determined that almost 10,000 civilians had survived the fighting in the city, among them nearly 1,000 children of whom only nine were re-united with their parents. The physical condition of the German prisoners of war was so miserable, many died shortly after their arrest. In particular the long cold marches to the prison camps took their toll. Anyone too exhausted to carry on was either shot or simply left behind. Towards the spring already half of the prisoners had died. The Soviets had also gravely underestimated the number of prisoners and so had far too little food available. Generals and junior officers fared a lot better. The generals were taken to a camp in the vicinity of Moscow by luxurious train. Whether they made it depended strongly on their rank. Out of the men and junior officers over 95% died, 55% of the officers and only 5% of the senior officers. In the spring, the other officers and men were also relocated. Much less attention was paid to the conditions during their transport as compared to that of the generals. Again many died. The soldiers and officers were scattered all over the Soviet Union. A number of men remained behind in Stalingrad to rebuild the city and to salvage the vessels of the Volga flotilla. Many former soldiers of 6. Armee were afraid they would be kept prisoner there for years to come. Their fears were later confirmed by Vyacheslav M Molotov (Bio Molotov) with his announcement that not a single German prisoner was to return home before Stalingrad had been rebuilt. Soon after the victory at Stalingrad, the Soviet made plans to undermine the Nazi regime and replace it by a Communist puppet state. Prisoners of all ranks were to be divided in fascists and anti-fascists. To this end, the N.K.V.D. established the Nationalkomitee Freies Deutschland (N.K.F.D. or national committee of free Germany). Two months later, another group was established, the Bund Deutscher Offiziere (B.D.O., Union of German officers). During the interrogations by the N.K.V.D., three German generals were identified as possible collaborators, among them Walther von Seydlitz-Kurzbach (Bio Von Seydlitz). They had to try and persuade other generals. A few furious colleagues accused them of treason but others let themselves be persuaded. Von Seydlitz-Kurzbach was placed in charge of the B.D.O. The union mainly tried to stimulate German soldiers to surrender and incite the officer’s corps to dethrone Hitler. After the failed attempt on Hitler on July 20th, 1944, Paulus also joined in. Hitler was furious when news of the treason of the generals reached him. He had Von Seydlitz-Kurzbach sentenced to death in absentia. In 1949, a number of prisoners was suddenly tried for war crimes. A court martial pronounced General der Infanterie Karl Strecker guilty of the destruction of the tractor factory, although the factory had already been pounded to rubble when Strecker’s men arrived. Von Seydlitz-Kurzbach was also sentenced as a war criminal. Both generals were sentenced to 25 years imprisonment. From 1945 onwards, in and around Stalingrad, some 3,000 prisoners of war were released, individually or in groups. In 1955, some 2,000 survivors of the battle for Stalingrad remained in the Soviet Union. Following a visit to Moscow by German Bundeskanzler Konrad Adenauer in September 1955, most of them were released. In January 1946, the last prisoners were released, 13 years after the end of the war. A total of some 6,000 prisoners of war would eventually return to Germany. Friedrich Paulus lived in the D.D.R. after his release where he wrote a series of articles to explain his position. He died in Dresden in 1957 after a prolonged illness. Walther von Seydlitz-Kurzbach was hated by many in Germany. He died, embittered and disillusioned in 1976 in Bremen. Vasily L. Chuikov was appointed commander of the force of occupation in Germany and deputy Minister of Defense under Nikita S. Chrushev. In 1955 he was appointed Marshal of the Soviet Union, just like his former chief of staff of 62nd Army, Nikolai I. Krylov and the former commander of the Stalingrad front Andrei I. Yeryomenko. Chuikov died in 1982 and was buried on the Mamayev Kurgan in Volgograd, the former Stalingrad. Generalfeldmarschall Paulus is taken prisoner. Colonel-generals Rokossovsky and Voronov interrogate Paulus. A somber view of the city shortly after the battle. A statue was erected on top of the Mamayev Kurgan in memory of the victims of the battle for Stalingrad. Bron: Felix Dalberger. BEEVOR, A., Stalingrad, Uitgeverij Contact, 2003. CARELL, P., Stalingrad, Schiffer Publishing Ltd., 1993. CHANEY, O.P. JR., Zjoekov, Standaard Uitgeverij, Antwerpen, 1995. CRAIG, W., Opmars en ondergang, Omega Boek B.V., Amsterdam, 1974. ERICKSON, J., The Road to Stalingrad, Weidenfeld and Nicolson Ltd., Londen, 1983. GLANTZ, D.M., Armageddon in Stalingrad, University Press of Kansas, Lawrence, 2009. GLANTZ, D.M., Colossus Reborn, University Press of Kansas, Lawrence, 2005. GLANTZ, D.M., Endgame at Stalingrad, University Press of Kansas, Lawrence, 2014. GLANTZ, D.M., To the Gates of Stalingrad, University Press of Kansas, Lawrence, 2009. HAUPT, W., Krim Stalingrad Kaukasus, Podzun-Pallas-Verlag, Dorheim, 1977. JONES, M.K., Stalingrad, Pen & Sword Military, Barnsley, 2007. JUKES, G., Stalingrad, Standaard Uitgeverij, Antwerpen, 1972. MAWDSLEY, E., Thunder in the East, Hodder Education, Londen, 2005. MERRIDALE, C., Ivans Oorlog, Nieuw Amsterdam, Amsterdam, 2007. OVERY, R., Ruslands oorlog, Uitgeverij Aspekt, Soesterberg, 2005. PIEKALKIEWICZ, J., Stalingrad, Südwest Verlag GmbH & Co.KG, München, 1977. ROBERTS, G., Stalin's Wars, Yale University Press, New Haven, 2006. SETH, R., De slag om Stalingrad, Het Spectrum N.V., 1962. TSJOEIKOV, V.I., Stalingrad, U.-M. 'West-Friesland', Hoorn. ZENTNER, C., Stalingrad, VPM Verlagsunion Pabel Moewig KG, Rastatt.